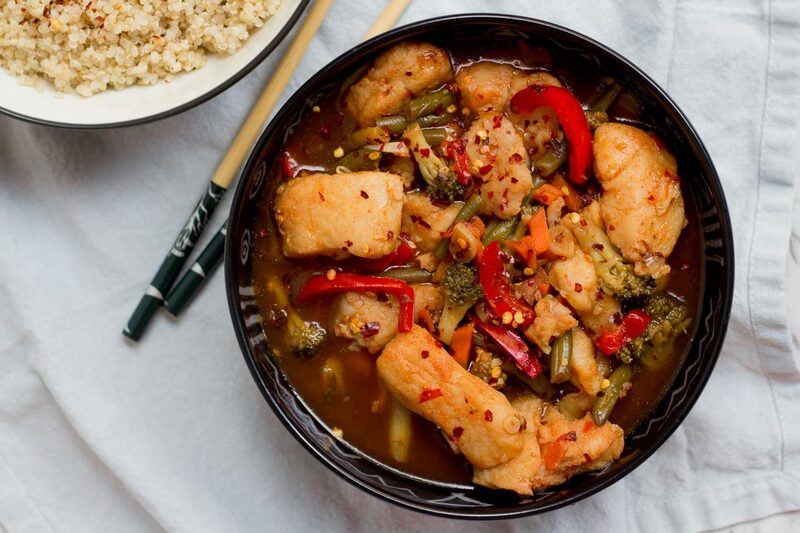 This Chinese style fish and vegetable stir fry is made with just 1 teaspoon of oil! Healthy and delicious it’s perfect for dinner and can also be meal prepped for lunch during the week. Serve with quinoa or brown rice to amp up the health quotient. Fish is something that I have only started experimenting with in the past few years and what I usually get are boneless fish fillets. No bones, no need to fillet anything or clean – super simple to use for a beginner. My favourite ways (it can’t be just one!) to eat fish has to be fried fish, in a Desi style curry with coconut milk (yum!) 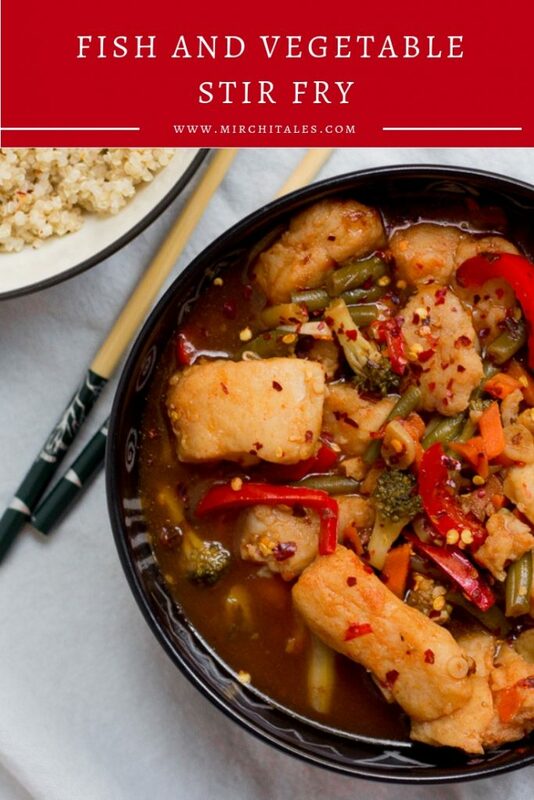 or what I call this Chinese style fish and vegetable stir fry. 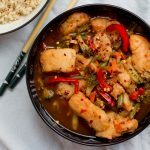 The fish with mixed vegetables stir fry is something that I love making for dinner at home or for office lunches. It’s got an Asian style sauce with a bit of heat from red chili and of course sriracha sauce. I use minimal oil, add lots of vegetables and serve it with brown rice or quinoa. In fact, I have even eaten it on it’s own with a light salad on the side. It’s also an excellent option for meal prepping – I make a batch on the weekend, and divide it into lunch boxes over quinoa for the week ahead. Stays great for upto 4 days in the fridge. A firm white fleshed fish fillet (boneless of course) is what I like to work with. Tilapia, basa fillets, barramundi, cod, snapper and salmon are some examples of fish that you can use based on what is available and your personal preference. I usually get the fillets, and then slice them. Make sure to select fresh fish – it should smell of the sea, but not smell ‘smelly’. 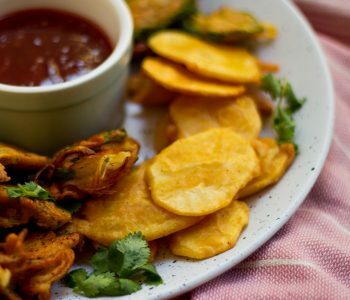 Though you could add the ingredients one by one while you are cooking the fish and vegetables, it’s better to make the marinade in a bowl, and set it aside. Believe me – I have done a dash of this and a dash of that, and it’s always resulted in a messy kitchen and an oh no – turn off the stove or the fish will burn. You can also adjust the sauce based on what you like. Skip the sriracha sauce if you don’t like spice, or add more honey. You can use fresh or frozen vegetables; I use both or a mix depending on the amount of time available to me. If you are using fresh vegetables, make sure to use ones that are in season – not only are they fresh, they are also affordable. Onions, carrots, capsicum, green beans and corn and peas are just the basics that you can use in your stir-fry. Broccoli, choy sum, bok choy are vegetables that you can experiment with if available in your region – there’s no need to blow your budget for a fancy vegetable. To learn more about how to cook brown rice, go to my recipe for brown rice with chicken and vegetables. 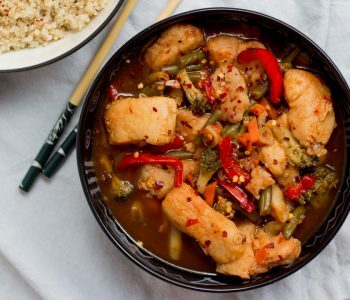 This Chinese style fish and vegetable stir fry is made with just 1 teaspoon of oil! Healthy and delicious it’s perfect for dinner and can also be meal prepped for lunch during the week. Add all the marinade ingredients in a small jug, along with 1 garlic clove, sliced Whisk together and set aside. Slice fish vertically, and place in a dish / bowl. Add garlic paste, salt and red chili powder. Mix and let it sit for 10 minutes. Heat 1/2 teaspoon oil in a non-stick pan, and add the fish. 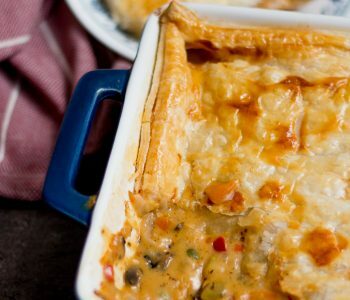 Don’t crowd the pan, and cook in 2 - 3 batches if the pan cannot accommodate all the fish in one go. Cook for a few minutes on both sides till the fish colour changes from translucent to white / pink. Take out the fish and set it aside on a plate. In the same pan, heat 1/2 teaspoon of remaining oil and add 1 garlic clove sliced. Once the flavour of the garlic is released add the sliced capsicum. Saute for a minute and then add the frozen vegetable mix or fresh vegetables. See notes on how and what vegetables to use. Add about half of the sauce, and mix together. Add the cooked fish, and the rest of the marinade. Once the fish is added, be careful while mixing as the fish can break apart. Depending on the gravy that is preferred, add chicken stock and bring to a boil. Add cornstarch slurry (cornflour dissolved in water) to thicken the sauce. Taste and adjust salt and spice as needed. Serve hot with quinoa, brown rice or white rice. Garnish with sesame seeds and spring onions. If using a mixture of vegetables, add the ones that take more time to cook first and then add the first. For instance, add onions and carrots first, followed by capsicum, broccoli, green beans or Asian greens. Add the corn right at the end. Vegetables that can be used include onions, capsicum, broccoli, carrots, green beans, cabbage, Asian greens like bok choy or choy sum and corn.